I love end of the year lists and to choose the favorites of something. In this case it’s my 10 favorite Cast Recordings (soundtrack of musical movies included) of 2015. So, besides revealing my choices, I took a personal, a really personal, look at more or less 30 recordings that were released last year. Before reading this keep, in mind the following: I have old fashion tastes, a nice way to say that I’m very narrow-minded when it comes to music; I don’t have any kind of musical formation except that I know what I enjoy to listen to. Last, but not least, take a look at my all time 20 Favorite Scores. LADY, BE GOOD – 2015 Encores! AN AMERICAN IN PARIS – How I love a Gershwin tune, it’s always a pleasure to my ears. Here there’re plenty of his songs, plus more classical pieces of music, all sung with gusto by the cast and beautifully played by the orchestra. This isn’t as exciting as MY ONE AND ONLY and CRAZY FOR YOU, but let the Gershwin music embrace you, “put on your dancing shoes and watch your spirits climb!” To read my review click here. BEGGAR’S OPERA – If you like 18th Century music, this London Cast recording might be for you, but it isn’t definitely for me. I think the songs sound too much alike and it’s kind of monotonous and boring. To read my review click here. BEND IT LIKE BECKHAM – For the stage adaptation of the hit movie, Howard Goodall & Charles Hart wrote a pop score, with a little touch of Bollywood and heavy on ballads, which I’m sure could please a lot of people but not me. In the whole, it’s kind of strange. CLINTON THE MUSICAL – This is what I call a loud, confusing and irritating score. Maybe it works on stage, but it’s one of those scores that I only played once and I try to forget all about it. DAMES AT SEA – I doubt the recent Broadway production will be recorded, but this London cast is a pleasure to my ears. This is musical heaven for anyone who, like me, loves traditional musical scores and it’s so deliciously funny and melodious that it’s impossible not to succumb to its charms. Personally, I simply love this kind of stuff! This is pastiche at its best! To read my review click here. DOCTOR ZHIVAGO – The music by Lucy Simon takes us back to the time of the big dramas by Claude-Michel Schönberg & Alain Boublil or the musicals by Frank Wildhorn. Ballads and epic numbers fill the emotional score. I’m not a huge fan of this style, but it’s an interesting score, sung by a very good cast. ELF – This London Cast recording is as good, if not even better, than the Broadway one. The Christmas delightful score by Matthew Sklar & Chad Beguelin warms your heart, puts your foot taping and, if you find yourself humming, that’s magic! I really like this one! FINDING NEVERLAND – It’s very rare for me to enjoy a pop score and this one by Gary Barlow & Eliot Kennedy didn’t catch my fancy. For me, all the songs sound too much alike and sometimes it reminds me of the Eurovision Festival songs; not a good thing. FUN HOME – Jeanine Tesori & Lisa Korn wrote one of those scores that I believe may work beautifully on stage. As for the recording, it has some good songs (“Days and Days” come to my mind) and a terrific cast, but it didn’t won my heart. GALAVANT – A kind of companion piece to SPAMALOT with songs by Alan Menken & Glenn Slater, this television soundtrack is fun to listen to and have more than a couple of good songs. My favorite song is the Broadwayish “No One But You”. To read my review click here. GIGI – I always liked the MGM movie soundtrack, but in this new lush and lively recording the songs sound refreshing and it’s now my favorite rendition of this score. It’s true, I miss Maurice Chevalier and I don’t like Vanessa Hudgens voice that much, but the rest is really good. I think this is a great way to discover or rediscover this classic melodious score by Loewe & Lerner. To read my review click here. THE GOLDEN APPLE – For many Musical lovers, this score by Jerome Moross & John Latouche is a treasure and for them this first full-length recording is an essential one. Personally, I never cared much for this score and, with the exception of the terrific “Lazy Afternoon”, it never made a big impression on me. Maybe it’s too operatic for my lighter tastes. 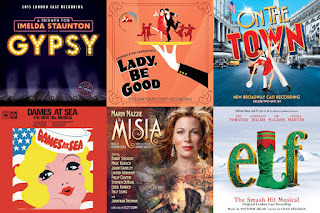 GYPSY – One of my all time favorite scores get’s a new London Cast recording where Imelda Staunton shines; her Rose may not have the voice of previous ones, but she really has the guts and sounds real. As for the score, it’s simply perfect! HAMILTON – Before you kill me, let me explain something. I simply hate hip-hop and rap, so it will be impossible for me to enjoy this so hyped score. Like it happens with RENT, I believe it might work on stage even for me, but this is the kind of recording I have a hard time playing for my pleasure. Sorry, but I’m sure it will be a big winner at the Tonys, but not in my heart. HIS MONKEY WIFE – Probably, the biggest curiosity of the year. With a score written by Sandy Wilson, musically this is closer to his VALMOUTH than to his THE BOY FRIEND; I confess I prefer the later. Very British in style, it’s also kind of strange, but melodic. I’m sure Musical enthusiasts will want to add this recording to their collection, I did! IT SHOULDA BEEN YOU – This might not be a great score, but it sure is a pleasant one, sung with gusto by a great cast. The songs by Barbara Anselim & Brian Hargrove brings us back to the days were a musical was supposed to be just entertaining and I really like that. JAMES AND THE GIANT PEACH – A cast of Broadway veterans give life to this new musical by Benj Pasek & Justin Paul. The score is an entertaining one with nice melodies, vaudeville numbers and more than a couple of contagious numbers. To read my review click here. THE KING AND I – For me this is one of the best scores written by Rodgers & Hammerstein, but this new recording isn’t as good as I wish it would be. To begin with, Ken Watanabe is probably the worst singing King I’ve listened to. As for Kelli O’Hara, she has a beautiful sweet voice, but I miss the nuances of, for example, Donna Murphy. Even so, it’s always a pleasure to hear these wonderful songs. LADY, BE GOOD! – One of the best Gershwin’s scores in a new and terrific recording. It’s true, the previous studio cast recording was as good as this one, but it’s always a pleasure to hear great songs sung by a winning cast. And who can resist Tommy Tune revisiting one of his numbers from MY ONE AND ONLY? I can’t. This is one of the best recordings of the year! THE LIGHT PRINCESS – Like FINDING NEVERLAND, with which it sounds very similar, this Tori Amos pop score didn’t conquer me. The songs sound too alike, with a few nuances along the way, and none of them stand out. But what do I know about pop scores? Absolutely nothing. MISIA – To find a new Vernon Duke in 2015 is a joy no musical lover can resist, specially when a great lady is leading the cast, Marin Mazzie. She’s at her best, with wonderful support by a terrific group of male supporters, plus Lauren Worsham. Like Duke’s best work, the songs have a haunting quality that grows on us. I believe this is one of the best releases of the year and, probably, the best surprise of the year! To read my review click here. ON THE TOWN – I believe this is the less operatic recording of this score and maybe that’s why I love it so much. The cast is terrific and so is the orchestra, turning this into the most refreshing and exciting recording of the classic Leonard Bernstein, Betty Comden & Adolph Green’s musical. A must! To read my review click here. ON THE TWENTIETH CENTURY – I was never a big fan of the original Broadway cast, so imagine my surprise when I realized this was a highly entertaining score. The new cast and orchestrations make it sound livelier and more theatrical. Kristin Chenoweth is on top form and the end result is one of the best releases of 2015! To read my review click here. PAGEANT – In the footsteps of the Howard Crabtree’s gay musicals, this Off-Broadway Cast recording isn’t as funny as I expected. The cast sounds like they are having more fun than us, but it isn’t a boring score and it has at least a couple of enjoyable songs: “Something Extra” being the best. SCHOOL OF ROCK – Andrew Lloyd Webber’s new score it isn’t definitely for me. Sincerely, I think it’s probably his worst score, but I hate rock, so why did I bother to listen to this? Well, I expected to find at least a song in the vein of his more famous tunes. I was wrong, there’s nothing for me here. THE SCOTTSBORO BOYS – Like with ELF, this London Cast (with several members from the Broadway production repeating their roles) recording is as good or even better than the Broadway one. Somehow, the Kander & Ebb score sounds more theatrical and lively here and I enjoy that. SEVEN BRIDES FOR SEVEN BROTHERS – I think Gene de Paul & Johnny Mercer’s score is one of the best original ones written for a MGM musical. This new studio recording brings it back to life, added the new songs that Al Kasha & Joel Hirschhorn wrote for the stage adaptation, and for the first time this new songs blend perfectly with the movie ones. A very pleasant surprise with a good cast! SIDE SHOW – I’m a huge fan of the original Broadway cast and although this new recording doesn’t have the emotional power of that one it still is contemporary Broadway at its best! As the Siamese twins, Erin Davie & Emily Padgett deliver their songs with talent and emotion, making it impossible no to enjoy the Henry Krieger & Bill Russell score. To read my review click here. SOMETHING ROTTEN – It’s true, the more modern (can I say rock?) songs aren’t for my taste, but how could I resist a song like “A Musical”? This is an amusing score, with a talented cast and enjoyable orchestrations. There’s nothing serious about it, it’s just pure fun! To read my review click here. TWO’S COMPANY – Bette Davis in a musical revue may sound strange and it is. I love Davis, but her singing voice wasn’t her best talent; but she sounds like she was having fun with her numbers, specially “Roll Along, Sadie”. The score is by Vernon Duke and includes the beautiful “Roundabout”; this isn’t his best work, but it’s a historic recording that will look well on every musical fan’s music library. To read my review click here. THE VISIT – This musical by Kander & Ebb took almost 15 years to arrive on Broadway, but it did in 2015 and the result is an haunting score, that reminded me of the work of Kurt Weill. I believe this might be Chita Rivera’s swan song and it’s an exquisite one. Let the quiet charms of this score conquer you. To read my review click here. THE WIZ! LIVE – Don’t kill me, but I think orchestrator Stephen Oremus gave this pop-soul score a more exciting and musical feeling than in previous recordings of the score. Shanice Williams shines as Dorothy and the emotional songs will lift your spirits. To read my review click here. You can also take a look at CAST RECORDINGS OF 2014 - A PERSONAL LOOK. To me, this list shows the disparity between generations and their respective tastes. As a 19 year old theatre student, it seems that we have nearly opposite tastes. For example, I hated "Dames at Sea" and adored "The Light Princess." I absolutely appreciate classics and Golden Age, but the thing I love most about theatre is the way that it can instigate social change by challenging the status quo. As important as Gershwin and Rogers and Hammerstein pieces are, they don't speak particularly well to the changing music scene or current social issues. If you think of masterpieces like "Phantom of the Opera," which challenged the typical theatre ideals by combining classical vocal technique with rock undertones, things like "Hamilton," the first hit hip-hop musical, could soon join history with the same prestige. The world is changing and theatre has to be a part of that, challenging listeners of all ages to be more open-minded when it comes to new music styles.